There's little doubt Hall of Fame coach Scotty Bowman will take a trip down memory lane when he steps behind the bench for the 2013 Winter Classic alumni game on New Year's Eve at Comerica Park in Detroit. 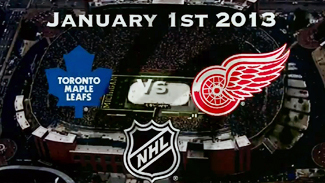 The Detroit Red Wings and Toronto Maple Leafs on Thursday announced the addition of nine players scheduled to participate in alumni game festivities on Dec. 31, one day before the current NHL teams meet at Michigan Stadium in Ann Arbor in the Bridgestone Winter Classic. Bowman will coach the Red Wings alumni while Pat Quinn directs the Maple Leafs. Among the nine additional players participating in the contest, three are from Detroit's famed "Russian Five," including Vyacheslav Fetisov, Igor Larionov and Sergei Fedorov. Vladimir Konstantinov is also scheduled to be on hand. The five-man unit for the Wings was put together by Bowman more than two decades ago. "This will be the first time Winter Classic for me," Larionov said. "And I've never been to a game at Michigan Stadium, but of course, I've seen the games on TV and I'm looking forward to watching that game and lacing them up to play in front of 40,000 (fans) at Comerica Park. That will be nice." The unit included defensemen Festisov and Konstantinov, and forwards Larionov, Fedorov and Vyacheslav Kozlov. The "Russian Five" played an instrumental role during the Red Wings' success in the late-1990s. Detroit won the Stanley Cup in 1997 and '98 and Fetisov (2001) and Larionov (2008) were ultimately inducted into the Hockey Hall of Fame. "I'm looking forward to it; it's exciting," Larionov said. "I saw Slava in Moscow for the funeral for Vladi Krutov and he wants to play. I told (Red Wings general manager) Kenny (Holland) that he wants to play and if he has room for him, so Slava will be flying in for the game too." In addition to the "Russian Five," the Maple Leafs have added Russ Courtnall, Bill Derlago, Bob McGill, all-stars Vincent Damphousse and Dave Ellett, and 50-goal scorer Gary Leeman. The six Toronto players combined for 5,463 NHL games, 1,287 goals and 3,471 points. Members of the Maple Leafs alumni scheduled to participate in the game now include Leeman, Courtnall, Derlago, McGill, Damphousse and Ellett, along with Darryl Sittler, Rick Vaive, Darcy Tucker, Felix Potvin, Mike Palmateer, Dave Andreychuk, Doug Gilmour, Curtis Joseph, Johnny Bower, Wendel Clark, Jim McKenny, Kevin Maguire and Ron Ellis. The three members of the "Russian Five" are joined on the Red Wings roster by Mickey Redmond, John Ogrodnick, Luc Robitaille, Dino Ciccarelli, Chris Chelios, Larry Murphy, Mark Howe, Chris Osgood and Mike Vernon, and all four members of Detroit's infamous "Grind Line" -- Kris Draper, Kirk Maltby, Darren McCarty and Joey Kocur. Ted Lindsay, Alex Delvecchio and Gordie Howe are expected to make appearances, but not play. Barry Smith will be Bowman's assistant on the bench. The pair was together for Detroit's championship runs in 1997, 1998 and 2002. Quinn, who last coached the Edmonton Oilers in 2009-10, will be joined behind the bench by Hall of Famer Red Kelly, who played for Toronto and Detroit during his 20-year career. There will be two alumni games played Dec. 31 due to the interest from so many players.